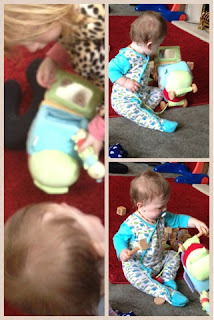 A while ago we were sent a lovely toy to review for Zach. Many of his toys have been old toys of Gracie's so was nice for him to have something brand new for himself. We were sent the Softly Snail Activity Fun House toy from Little Bird Told Me. Little Bird told me are a online retailer of great quality baby toys especially made to capture a childs imagination and encourage explorative play. From soft toys to rocking animals and fun playmats they have a large range to choose from. The softly snail activity fun house came in an easy to open cardboard packaging meaning no stress trying to get the you out quickly and all the packaging was recyclable which is an added plus. First of all just looking at the toy I could see it was fantastic quality with lots of ways for a baby to play with it so they don't get bored to quick. softly snail has a house for a shell with a little caterpillar rattle hiding inside (or wiggly woo as he's been named in our house) the roof of the house opens to reveal wiggly woo and a little mirror on the roof flap. The door on the side of the house has a slot you can place a photo in for an added surprise. Her antennae even rattle and squeak! 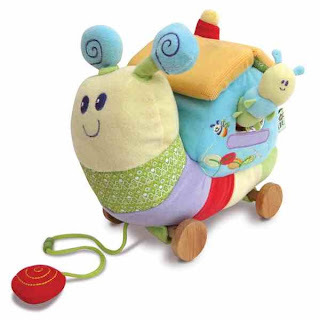 There are wooden wheels attached underneath the snail so she can be used as a pull along. Zach loves playing with softly snail, she lives at the top of the toybox and is dragged around the front room on a daily basis. In fact she is played with by both kids. They especially like the caterpillar hiding inside. Only downside I would say is that she is slightly too heavy for the wheels so when the kids pull her too quickly she spends lots of time being dragged around on her side rather than upright! Not that that affects what the kids think of her. They just seem to love that there is so much going on with one toy which creates hours of fun. I would definitely recommend the softly snail activity fun house or any other product from the Little Bird Told Me range. The rocking animals look fab and I wish I'd have seen the playmats back when Zach was small enough to use one! You can see the full range from Little Bird Told Me on their website. http://www.littlebirdtoldme.co.uk/shop/. You can also follow them on facebook or Twitter for the latest news and updates on all their products. We were sent this item free of charge for the purpose of this review. All views and opinions are my own. ah looks like a fab little toy! I love the look of this, might have to get one for Max! Review: Macmillan Books: Wake Up Do Lydia Lou!